A theatre production of the Wizard of Oz is holding auditions for a special pooch that can look adoringly at Dorothy as she sings Over the Rainbow. The New Theatre Royal in Lincoln is staging the production in April. Artistic director Natalie Hayes-Cowley said those auditioning needed to be small, obedient, and not bark at the audience during the “iconic song”. 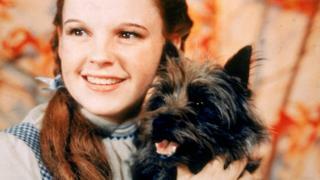 “We are looking for a dog who can have a lovely relationship with Dorothy,” she said. As part of the auditions – which take place on Sunday – the performing pooches will have to sit with Dorothy, played by Sophie Towns, while she sings. They will have to cope with stage lighting and different sound effects, including applause. “Dogs are like children and can be unpredictable,” Ms Hayes-Cowley said. She said the main thing was to see the dog with Dorothy while she sings. She added that her own dog Louie would not be auditioning as he was “a real mummy’s boy” and would be too nervous to be on stage. The theatre’s box office should be notified of any potential stars in advance. Hudson Yards: A billionaire's playground?